Most commonly prescribed treatments for calf and Achilles tendon pain aren't entirely effective because they fail to take the role the calves and Achilles play in the running stride into the equation. The fourth article in our Build a Better Runner Series (read the first, second and third articles) identifies how the calves and Achilles are activated during running. This provides insight into how runners can better focus their efforts on strengthening these areas to prevent injuries and run more efficiently. The calf consists of two muscles: the gastrocnemius and the soleus. 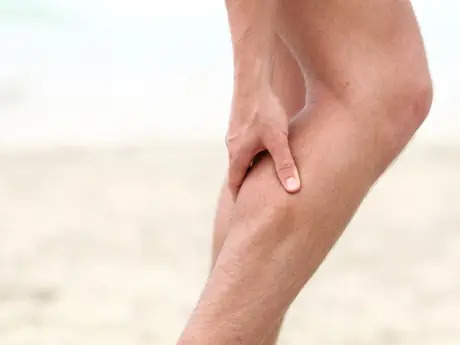 The gastrocnemius has two "heads," which make up the meatier upper part of the calf, while the soleus is the more slender lower part of the muscle. It's a misconception that the calves assist in propelling the body forward at toe off during the running stride. Recent research and understanding of running mechanics shows this isn't the case. In fact, the calf is most active as the foot contacts the ground and begins to generate hip extension to propel the runner forward. This realization totally flips the treatment approach to calf injuries on its head. Rather than performing calf raises to improve absolute strength, we need to look at how we can reduce the load on the gastrocnemius as the foot contacts the ground. This is accomplished by improving running form—specifically, ensuring that you generate proper hip extension from the hamstrings and glutes so the leg passes under the body in a bent position, which takes pressure off the gastrocnemius. Since we now know that the gastrocnemius and soleus are not primarily activated or used at toe off, generic calf raises aren't effective running-specific strengthening exercises. Rather, you need to prevent calf injuries in two contexts. First, strengthen the hips and glutes to ensure that you generate enough power to prevent the leg from being straight as it passes underneath the body. Second, strengthen the calf muscles in the same way they are used during running. This is achieved by bending the knee slightly and applying pressure downwards—just like the exact moment your foot hits the ground and begins to drive back during running. Instructions: With your foot or heel attached to a cable machine, stand facing the structure. Balance on one foot (it's OK to hold on to another object for balance) and bring your leg slightly in front of you. Drive backwards with your foot in the band. Focus on generating the movement from your glutes and hamstrings. Slowly bring the leg back up and repeat. Complete 20 to 25 reps with each leg. Instructions: Lie flat on your back with one leg bent, foot flat on the floor (or a stability ball for added difficulty), and the other leg flat on the ground. Slowly lift your pelvis off the ground by contracting your glutes and core while keeping your shoulder blades flat on the ground. Complete 15 to 20 reps on each leg. Instructions: Start on all fours. Insert a theraband so one end is wrapped around your knee and the other around the bottom of your foot. Extend your leg back and up, focusing on contracting with your glutes. Complete 15 to 20 reps on each leg. Instructions: Run forward by keeping your legs straight and driving through the ground with your hips and glutes. Begin by running 50 meters. Progress until you can run 100 meters. Jeff Gaudette is a 2:22 marathoner and owner of RunnersConnect, a team of expert coaches dedicated to helping you run faster with the latest running and nutrition research as well as training insights from elite runners. He recently released a free eBook, 16 Weeks to a Faster Marathon. Download it now. How Valuable Is Your Running Technology?